Many thanks to Dr Sylvia Ditchburn for so generously donating this marvellous print of one of her original works. Raffle tickets will be on sale at all 2018 events. 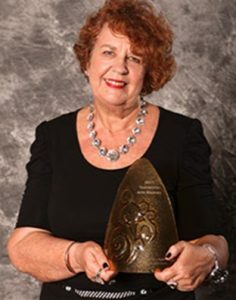 Since coming to north Queensland from the Darling Downs in the 1960s, Sylvia has been inspired by the tropical environment for her work. After graduating with a Phd in 2000 at James Cook University Townsville, Dr Ditchburn continues to depict Australian natural environments in her typically vibrant gouache and acrylic palette. A freelance fine artist and essentially plein-air painter, Sylvia brings together images from her extensive painting trips throughout Australia. These include the Kimberley and Broome in West Australia, MacDonnell Ranges, Uluru, Kata Tjuta and Devil’s Marbles in central Australia, Simpson and Painted deserts, Lake Eyre, Flinders Ranges in south Australia, Lost City and Kakadu in the Northern Territory, contrasted with the lush and dry tropics of north Queensland coastal fringe. 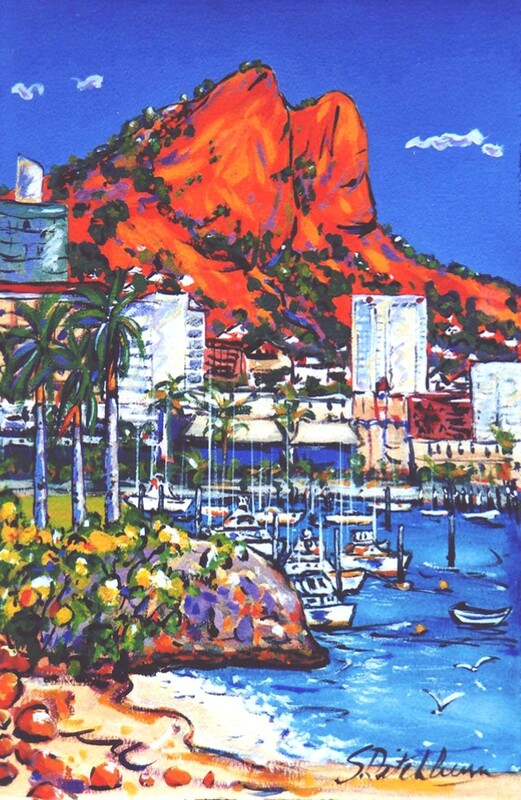 The framed art work I am donating to the ACVC Remember Townsville is a reproduction of a painting I created of the marina and buildings with the iconic Castle Hill dominating the city skyline of Townsville. I noticed this view when I was dining with my husband at the Metropole Hotel, at the eastern end of Palmer Street. While we were waiting for our dinner I did a quick sketch and thought it had potential to develop into a painting. The next day I went back to do a few more drawings and take a few photos for reference. The painting came together really well and when it was framed I took it to Flinders Gallery, where I was exhibiting my work at the time. Luckily, I had a good photo of the painting because it sold very quickly. I had reproductions made and they have been one of my best sellers. I named the painting Remember Townsville because so many folk were looking for images of Townsville and Castle Hill to give as a gift to friends or work colleagues who were leaving Townsville. My Remember Townsville has been gifted to Queensland Premiers and visiting dignitaries by the Townsville City Council and gone to all parts of the world. I am very proud of it.